This piece originally appeared 5/21/16. But Watterson’s greatest influence was Peanuts. Watterson dealt with childhood’s indignities in the same way that Schulz did–head-on and without flinching. Watterson was capable of drawing magnificent, evocative landscapes for Calvin to explore, but he also knew when to dial it down and let the characters drive the stories themselves. Schulz had the courage to follow his characters wherever they took him. Many storylines did not end happily, and some recurring storylines never ended happily. Peppermint Patty always got D-minuses. Linus never got to meet the Great Pumpkin. Marcie’s crush on Charlie Brown went unrequited. And the football always got pulled away. Which brings us back to Moe. One subtlety I appreciated was the way that Moe talked. Whereas Calvin spoke with an outsized, rich vocabulary, Moe used a lot of monosyllabic words, and Watterson drew them in simple, unsophisticated print. You could almost hear Moe’s voice—deep, dull, and plodding—through its visualization. When he first debuted in the strip, Moe posed the threat of violence—you got the impression that Calvin wouldn’t pick a fight with someone so much bigger and stronger. But for all his posturing, Moe wasn’t actually violent—he seemed to be a lot of bark without a lot of bite. Calvin, on the other hand, had brains, and he used his smarts to gain the upper hand. It was a David and Goliath dynamic, and Calvin won out, even if Moe was too stupid to know it. 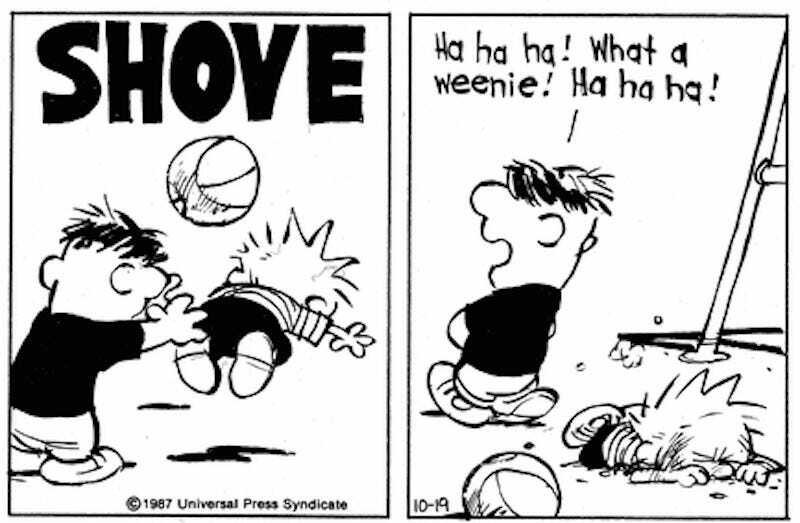 These early strips gave us the impression that Calvin could outwit his bully, or at the very least stall him. But that dynamic didn’t last. As the strip progressed, Moe became something much more intimidating—a monolithic force that couldn’t be reasoned with, bargained with, or appealed to on a higher moral ground. Moe just was, and that drove the majority of his appearances, including the strips that upset me so much as a child. Calvin spends the next four strips locked in an internal monologue. He airs out his frustrations and the moral implications of stealing the truck back. Is he justified in committing a moral wrong in response to a moral wrong? Would stealing it back result in even worse physical violence? And how would he even get away with it? The line that really gets me is in the first panel: “The oaf will probably break it too.” When I was a kid, there was a bully who used to steal my lunch whenever I bought chicken nuggets. And whenever I tried to get my lunch back, the bully would deliberately cough on the nuggets he stole. It made me cry—not only was something being taken from me, but it was being spoiled so that I wouldn’t even want it back. Ownership comes with pride, and Calvin knows that Moe will never love that truck the way he does. Eventually, after talking himself into stealing the truck, Calvin talks himself back out of it. The artwork in these panels really captures the internal torment that Calvin feels through its variety of facial expressions. I also appreciate the structure of the panels themselves: one of the panels is a circle, and, in the bottom strip, Watterson eliminates the borders entirely. Watterson has a well-documented history of rebelling against the constraints of the newspaper page. He disliked the lockstep conformity of three to four panels per daily. Getting rid of the border lines adds some much needed visual variety, and it also allows Calvin’s thoughts to run together. We get a sense of his harried mindstate as he deliberates over the best solution to his problem. So finally, after stalling for nearly a week of dailies, Calvin decides to appeal to Moe’s sense of right and wrong, rather than trying to steal the truck back. He states the injustice of the thing and demands that it be righted. Calvin already tried this four strips ago, and it didn’t work. But as an audience, we hold foolish hope. Maybe this time. We hope, despite everything we’ve been told, that the main character will win in the end. But again, Calvin is confronted by the monolith —if he wants the truck, he has to physically fight for it. And that’s a fight he cannot win. I think the reason why the truck storyline hurt so much to read is that it disproved the just world fallacy that positive actions will garner positive results and that negative actions will garner negative ones. The good guys will win, in the end. A morally bad person will pay for their misdeeds—if not now, then someday. But when I was being bullied, I took no pleasure in believing that my bullies would be failures someday. I wanted them to fail now. Failure, however, is never a guarantee. Some of the kids who bullied me are losers today. Others are successful and have families of their own. It’s even possible that their aggressive, unfeeling behavior put them in a prime position to succeed and get ahead of others, which is still difficult for me to accept. Watterson had the courage to tell kids the truth. Lesser cartoonists would have reassured us by giving us a happy ending. Calvin & Hobbes taught lonely, angry little kids that, at the end of the day, we had to take solace in our own goodness. The universe offered no immediate, karmic justice for wrongs that we endured, and doing the right thing meant merely that, nothing more. Things would not always turn out the way that we wanted to. But we could talk out and vent our problems. We could surround ourselves with people we loved and trusted, people who would not mistreat us. It wouldn’t fix the problem, but it could help us endure against it. At the end of the ‘truck strips,’ a wide-eyed Calvin hugged Hobbes in an act of boyish reassurance. I remember feeling very sad. There was nothing more to do? That was it? Yes. That was it. But if I wanted to be a good person, it would have to be enough.